Characters can be imported from Dark Sun: Shattered Lands (see Import characters). Floppy version prompts for answers from the manual. CD version has a disc check. CD version. Bundled with Dark Sun: Shattered Lands. Pre-packaged with DOSBox. Characters can be imported from Dark Sun: Shattered Lands. Make a new folder in the Wake of the Ravager installation folder (e.g. dsun). Copy the Shattered Lands saves (*.SAV) into this new folder. Edit the DOSBox configuration file (dosbox_darksun2_single.conf for GOG.com). Change ravager to chartran, then save the file. 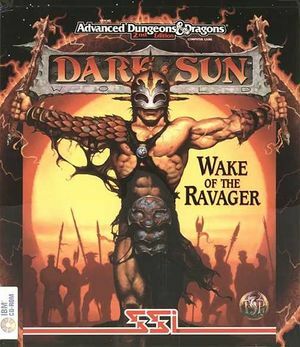 Run Dark Sun: Wake of the Ravager. Press 2 at the prompt. Type C for the drive. Enter the name of the installation folder (C:\ for GOG.com). Press ↵ Enter, then follow the prompts to choose the save to import from. Edit the DOSBox configuration file again. Change chartran back to ravager, then save the file. Run Dark Sun: Wake of the Ravager. The imported characters are now available in-game.